Runners have a greater choice of footwear than ever before, but conflicting study results make evidence-based shoe selection a challenge. And new research suggests that even what is known isn’t consistently being put into practice. Typically, the gait cycle begins with a lateral heel strike in a supinated foot position and then progresses to rapid pronation through 70% of the support phase.13 After maximal pronation, supination occurs from about 70% of support phase through toe-off.13 Pronation, which includes ankle dorsiflexion, subtalar eversion, and forefoot abduction, makes the foot more flexible to aid in shock absorption during the support phase. The effects further up the kinetic chain include tibial internal rotation, knee flexion, and hip flexion.14 Supination, which includes ankle plantar flexion, subtalar inversion, and forefoot adduction, makes the foot more rigid for propulsion. Tibial external rotation, knee extension, and hip extension occur as a result of foot supination.14 Excessive pronation or supination, therefore, can affect the entire kinetic chain. Arch type has been shown to be associated with specific patterns in ground force and muscle activation.15-17 High-arched runners tend to supinate more, with increased leg stiffness and a higher vertical loading rate, whereas low-arched runners tend to have increased pronation and eversion excursion.16,17 A rigid pes planus foot has been associated with overpronation and can lead to medial lower extremity soft-tissue and bone overload injuries.7,18-20 Pronation and low arch index have been also shown to be good predictors of anterior knee pain.19 A pes cavus foot has been associated with increased ground force and can be associated with lateral lower extremity injuries and stress fractures.4,16 The modern running shoe has, therefore, been designed to take these factors into account. Although many experts propose matching arch type with correlative shoe design,4,6,7,12,21,22 others have suggested that running shoe comfort is a more important factor to consider, as this may be related to pressure distribution under the foot.30 Another paradigm, proposed by Nigg, suggests that impact forces serve to tune muscles to minimize vibration and that previous suggestions to realign the skeletal system with footwear may need to be reconsidered.31 Newer running shoe models are now available that include minimal support and cushioning. Interestingly, a recent study has called into question whether shoes are necessary for running at all.32 Habitually barefoot runners tend to land on the forefoot or midfoot, while the habitually shod runner is more likely to land on the rearfoot due to the elevated heel and cushioning of the running shoe.32 Some authors claim that barefoot running may prevent the impact-related lower limb injuries experienced by many runners today.32 They cite evidence from gait studies showing that barefoot runners who land on the forefoot produce smaller peak impact forces than rearfoot strikers wearing running shoes.32 Barefoot running has also been shown to decrease joint torques at the hip, knee, and ankle compared to shod running.33 However, running shoe compliance may offset the increased torque when calculating actual joint forces.33 Torsion is the phenomenon of calcaneal and metatarsal uncoupling. One study found that modern shoes with torsional stiffness actually increase pronation, while the least amount of pronation occurs in barefoot running.34 More research is certain to come, but the practical issues of barefoot running—including tolerance of varying running surfaces and temperatures, among other factors—remain formidable barriers to its popularization. Nonpublished data from this study showed that when asked to match a specific arch type with common available recommendations with respect to correlative running shoe design, only 17.5%, 16.1%, and 31.4% correctly matched footwear recommended for a flatfoot, high arch, or neutral foot, respectively. About 60% of respondents answered incorrectly for all three arch types. Increased running experience was associated with a greater likelihood of a correct response. In summary, although runners in this study claimed running shoe selection based on arch type was important, they lacked the knowledge to make decisions according to these criteria.39 To this author’s knowledge, no published studies have investigated factors considered important for shoe selection by recreational or competitive adult runners. This may be considered an important area of future research as more running shoe choices become available. The selection and care of running shoes represents a potentially modifiable injury risk factor among runners. In spite of differing opinions on how running shoes may affect biomechanics, there is evidence that running biomechanics are altered based on shoe design.9,10,15,24,25 There is also debate as to how specific arch types may interact with running shoe design. Nonetheless, recommendations on selecting shoes based on specific arch types are common.4,6,7,12,21,22 Newer research has led to the introduction of minimally supportive shoes to simulate running barefoot, and barefoot running itself has become a topic of interest. Today, a multitude of running shoe styles are available. When considering running shoe selection and injury prevention, it is important to remember that much of the research on running injuries is in the form of expert opinion and comparison trials, as opposed to randomized controlled trials.5 Establishing footwear’s effects on the etiology of sports injuries can be a difficult task.40 In the future, more research will be needed to validate the current recommendations in the literature regarding running shoe selection and replacement decisions. Ryan C. Enke, MD, is a physical medicine and rehabilitation physician who staffs a running medicine clinic at Rockford Orthopedic Associates in Rockford, IL. He is the medical director of the Rockford Marathon. 1. http://www.nsga.org/i4a/pages/index.cfm?pageid=4203. Accessed April 14, 2010. 2. van Mechelen W. Running injuries. A review of the epidemiological literature. Sports Med 1992;14(5):320-335. 3. Cook SD, Brinker MR, Poche M. Running shoes. Their relationship to running injuries. Sports Med 1990;10(1):1-8. 4. Frey C. Footwear and stress fractures. Clin Sports Med 1997;16(2):249-257. 5. Johnston CA, Taunton JE, Lloyd-Smith DR, McKenzie DC. 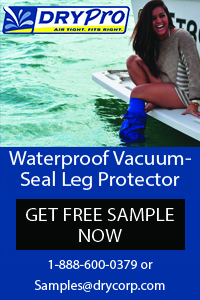 Preventing running injuries. Practical approach for family doctors. Can Fam Physician 2003;49(9):1101-1109. 6. McKenzie DC, Clement DB, Taunton JE. Running shoes, orthotics, and injuries. Sports Med 1985;2(5):334-347. 7. Cheung RT, Ng GY, Chen BF. Association of footwear with patellofemoral pain syndrome in runners. Sports Med 2006;36(3):199-205. 8. Kennedy JG, Knowles B, Dolan M, Bohne W. Foot and ankle injuries in the adolescent runner. Curr Opin Pediatr 2005;17(1):34-42. 9. Butler RJ, Davis IS, Hamill J. Interaction of arch type and footwear on running mechanics. Am J Sports Med 2006;34(12)1998-2005. 10. Frederick EC. Kinematically mediated effects of sport shoe design: a review. J Sports Sci 1986;4(3):169-184. 11. Nigg BM, Segesser B. [The running shoe—a means of preventing running complaints.] Z Orthop Ihre Grenzgeb 1986;124(6):765-771. 12. Yamashita MH. Evaluation and selection of shoe wear and orthoses for the runner. Phys Med Rehabil Clin N Am 2005;16(3):801-829. 13. Brubaker CE, James SL. Injuries to runners. Am J Sports Med 1974;2(4):189-198. 14. 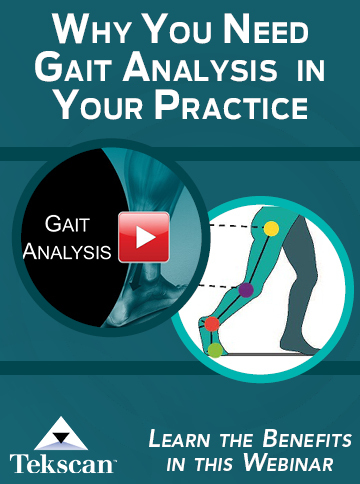 Dugan S, Bhat K. Biomechanics and analysis of running gait. Phys Med Rehabil Clin N Am 2005;16(3):603-621. 15. Wakeling JM, Pascual SA, Nigg BM. 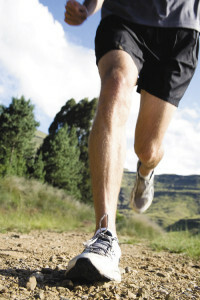 Altering muscle activity in the lower extremities by running with different shoes. Med Sci Sports Exerc 2002;34(9):1529-1532. 16. Williams DS 3rd, Davis IM, Scholz JP, et al. High-arched runners exhibit increased leg stiffness compared to low-arched runners. Gait Posture 2004;19(3):263-269. 17. Williams DS, McClay IS, Hamill J. Arch structure and injury patterns in runners. Clin Biomech 2001;16(4):341-347. 18. Bennett JE, Reinking MF, Pluemer B, et al. Factors contributing to the development of medial tibial stress syndrome in high school runners. J Orthop Sports Phys Ther 2001;31(9):504-510. 19. Duffey MJ, Martin DF, Cannon DW, et al. Etiologic factors associated with anterior knee pain in distance runners. Med Sci Sports Exerc 2000;32(11):1825-1832. 20. Yates B, White S. The incidence and risk factors in the development of medial tibial stress syndrome among naval recruits. Am J Sports Med 2004;32(3):772-780. 21. Asplund CA, Brown DL. The running shoe prescription. Phys Sportsmed 2005;33(1):17-24. 22. Johnson JA. The running shoe. In:O’Connor FG, Wilder RP, eds. Textbook of running medicine. New York: McGraw-Hill;2001:589-594. 23. 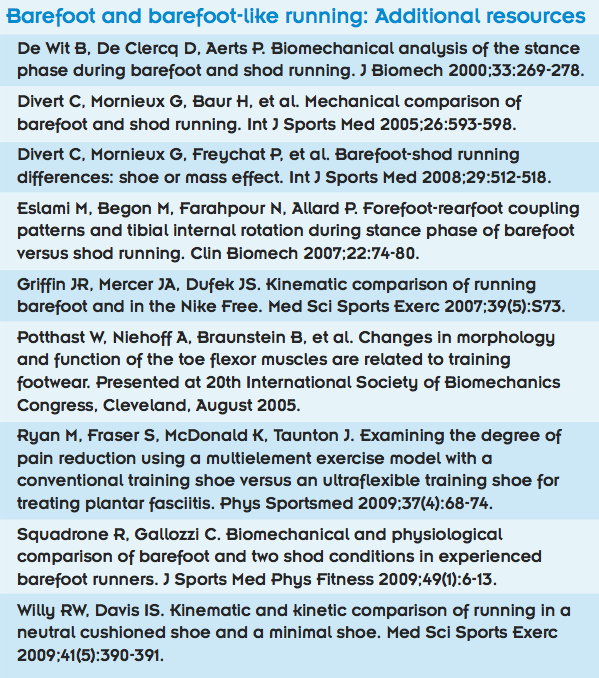 Richards CE, Magin PJ, Callister R. Is your prescription of distance running shoes evidence-based? Br J Sports Med 2009;43(3):159-162. 24. Clarke TE, Frederick EC, Hamill CL. The effects of shoe design parameters on rearfoot control in running. Med Sci Sports Exerc 1983;15(5):376-381. 25. Butler RJ, Hamill J, Davis I. Effect of footwear on high and low arched runners’ mechanics during a prolonged run. Gait Posture 2007;26(2):219-225. 26. Stacoff A, Reinschmidt C, Nigg BM, et al. Effects of shoe sole construction on skeletal motion during running. Med Sci Sports Exerc 2001;33(2):311-319. 27. Kersting UG, Kriwet A, Brüggemann GP. The role of footwear-independent variations in rearfoot movement on impact attenuation in heel-toe running. Res Sports Med 2006;14(2):117-134. 28. Rome K, Handoll HH, Ashford R. Interventions for preventing and treating stress fractures and stress reactions of bone of the lower limbs in young adults. Cochrane Database Syst Rev 2005;(2):CD000450. 29. Knapik JJ, Brosch LC, Venuto M, et al. Effect on injuries of assigning shoes based on foot shape in air force basic training. Am J Prev Med 2010;38(1 Suppl):S197-211. 30. Che H, Nigg BM, de Koning J. Relationship between plantar pressure distribution under the foot and insole comfort. Clin Biomech 1994;9(6):335-341. 31. Nigg BM. The role of impact forces and foot pronation: a new paradigm. Clin J Sport Med 2001;11(1):2-9. 32. Lieberman DE, Venkadesan M, Werbel WA, et al. Foot strike patterns and collision forces in habitually barefoot versus shod runners. Nature 2010;463(7280):531-535. 33. Kerrigan DC, Franz JR, Keenan GS, et al. The effect of running shoes on lower extremity joint torques. PM R 2009;1(12):1058-1063. 34. Stacoff A, Kalin X, Stussi E. The effects of shoes on the torsion and rearfoot motion in running. Med Sci Sports Exerc 1991;23(4):482-490. 35. Cook SD, Kester MA, Brunet ME. Shock absorption characteristics of running shoes. Am J Sports Med 1985;13(4):248-253. 36. Taunton JE, Ryan MB, Clement DB, et al. A prospective study of running injuries: the Vancouver Sun Run “In Training” clinics. Br J Sports Med 2003;37(3):239-244. 37. Verdejo R, Mills NJ. Heel-shoe interactions and the durability of EVA foam running-shoe midsoles. J Biomech 2004;37(9):1379-1386. 38. Dib MY, Smith J, Bernhardt KA, et al. Effect of environmental temperature on shock absorption properties of running shoes. Clin J Sport Med 2005;15(3):172-176. 39. Enke RC, Laskowski ER, Thomsen KM. Running shoe selection criteria among adolescent cross-country runners. PM R 2009;1(9):816-819. 40. Frederick EC. Physiological and ergonomics factors in running shoe design. Appl Ergon 1984;15(4):281-287. De Wit B, De Clercq D, Aerts P. Biomechanical analysis of the stance phase during barefoot and shod running. J Biomech 2000;33:269-278. Divert C, Mornieux G, Baur H, et al. 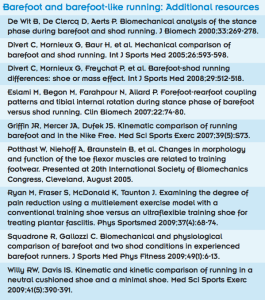 Mechanical comparison of barefoot and shod running. Int J Sports Med 2005;26:593-598. Divert C, Mornieux G, Freychat P, et al. Barefoot-shod running differences: shoe or mass effect. Int J Sports Med 2008;29:512-518. Eslami M, Begon M, Farahpour N, Allard P. Forefoot-rearfoot coupling patterns and tibial internal rotation during stance phase of barefoot versus shod running. Clin Biomech 2007;22:74-80. Griffin JR, Mercer JA, Dufek JS. Kinematic comparison of running barefoot and in the Nike Free. Med Sci Sports Exerc 2007;39(5):S73. Potthast W, Niehoff A, Braunstein B, et al. Changes in morphology and function of the toe flexor muscles are related to training footwear. 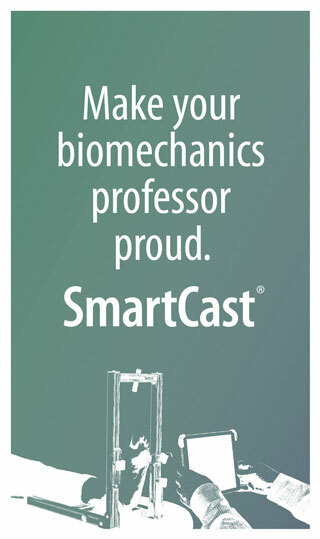 Presented at 20th International Society of Biomechanics Congress, Cleveland, August 2005. Ryan M, Fraser S, McDonald K, Taunton J. Examining the degree of pain reduction using a multielement exercise model with a conventional training shoe versus an ultraflexible training shoe for treating plantar fasciitis. Phys Sportsmed 2009;37(4):68-74. Squadrone R, Gallozzi C. Biomechanical and physiological comparison of barefoot and two shod conditions in experienced barefoot runners. J Sports Med Phys Fitness 2009;49(1):6-13. Willy RW, Davis IS. Kinematic and kinetic comparison of running in a neutral cushioned shoe and a minimal shoe. Med Sci Sports Exerc 2009;41(5):390-391.